NOW PLAYING SEPTEMBER’S BELLA PETITE HOUR LIFESTYLE EDITION- I’m back from Bali revived and ready to get you fit and heart healthy with my guest Nadine Hamden creator of EmpowerWalking! What a beautiful world we live in! Summer is here and we are receiving the blessings of the season. What a sheer joy it is to walk out the door and feel the sun’s warmth and the light breeze that caresses our cheeks. In the midst of enjoying this season, there is a hum that is about. I hear it everywhere. The hum is that of individuals that are possibly not enjoying the fullness that this gorgeous season brings us. The word is out that many people are feeling like the days are slipping by, like time is clicking away in a blink. I hear the talk of people feeling out of balance, trying to get everything done on the to do list, yet not feeling as if they are succeeding at it. The hum is calling for answers, screaming for balance in this ever changing and exquisitely beautiful world we live in. So let me ask you, have you been feeling out of balance lately? If so, please know that you are in the finest company. As a spiritual counselor and coach I hear so many people express how life seems to be changing so fast that they are feeling out of sorts, out of balance. They feel as if they are moving as fast as possible, yet things are still not complete, and there are not enough hours in the day to get it all done. When this is occurring in ones life, what soon follows is frustration and judgment. This is something that does not serve us and definitely does not assist us in getting back into balance. What we need in this ever-changing time is something that is consistent, something that supports us until we regain balance and remember again the power of who we truly are. It is true that the world right now is changing faster than ever before. With change, comes the opportunity to shift and adjust. Remember that as we shift our perception and adjust our viewpoint, all things shift with us. The Universe always meets us where we are. Yet, very often when change occurs, and one feels out of balance, the first thing individual’s do is stop giving time to their spiritual practice of inner growth and development. One often puts their practice aside so to “deal” with what is happening in their life. This is a grand mistake. At times like this when the outside world is releasing old structures and changing daily, is the most important time to go within. It is only here, within, that we may learn more about ourselves and how we can create a life of balance and a world of strength and love. What brings you peace? What daily practices do you have in place that gives you a sense of balance, self-love and inner strength? If you cannot think of any, then I invite you to be open to considering a daily practice of either meditation, journaling, inspirational reading, and/or begin writing a gratitude journal. These are only a few ideas and there are countless more that fit your unique self. Be still for a moment and allow your heart to lead you in creating a practice that you incorporate daily. Stretch yourself and start your day with a practice that honors you. It is only here, in deepening our spiritual practice that we find the balance we so yearn for. As the world changes, lets change with it to bring more love, more peace, and more possibilities to create a world that works for everyone. As we live what we know, we grow, and balance arrives in overflow. 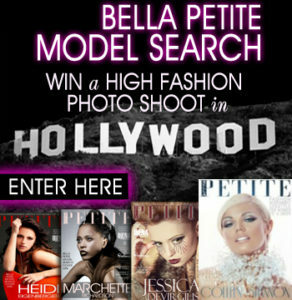 Enter the Bella Petite Magazine Cover Girl and Editorial petite model search. FREE subscription to Bella Petite Magazine Sweepstake giveaways, prizes and great discounts at My Sweet Petites, Allison Izu and Fernanda Carneiro to our registered members! Get a magazine you identify with! Bella Petite Magazine is Fashion, Entertainment and LifeStyle for Women 5’5″ Tall & under. Petite is fit and full figured. FREE MAGAZINE SUBSCRIPTION! The ideal balance is peace and love and somehow you get there with balance! Thanks for this. Gosh if only I could be more like this I would feel better about life.